A message about good dental health is probably more important to mothers of young children than to anyone else in our world today. We have titled this section, ‘The Trying Years,’ meaning the childhood period from age one to four. At age one the youngster can get around the house well enough to be able to get into everything. Children at this age are very curious, but unfortunately do not know the difference between a hot stove and a cold one, or the difference between grape juice and shoe polish. As any mother can tell you, little ones at this age need constant attention and supervision. Mothers are well versed in custodial tasks such as cleaning noses and bottoms but unfortun­ately, seldom do they clean mouths and teeth. WHY? Not because they are negligent, but because no one has ever made this an important thing to do. You should review the previous section called, ‘Protect the Precious’ it is designed to convey a message about oral health from birth to one's first birth­day. This message, ‘The Trying Years,’ is designed to help young mother properly care for her children's teeth from age one to age four. Please observe the illustration showing Mother and Child on a comfortable couch. This is the recommended position for the mother (or father, brother, sister, etc.) to begin cleaning the young one's mouth. 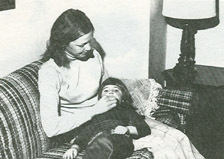 Notice how the child's head is tipped back making visual access easy for the person who is to clean the youngster's teeth. There are many small, soft tooth brushes available, specifically designed for children ages one to four. Avoid the electric gadgets and let your child get accustomed to proper manual brushing. Begin a gentle brushing motion WITHOUT using any toothpaste. At this age toothpaste is of no value; it will only irritate the youngster's mouth because most flavoring agents are too strong for the sensitive linings of mouths of children this young. Plus the fact that this position of cleaning is not conducive to a lot of foaming action as it would, tend to bother the child and make a mess of the family room or living room. All surfaces should be gently cleaned, inside and out, front and back...Once you have tried this method you will find it to be quite easy. The amount of time it takes is not as important as feeling satisfied that you have cleaned all areas thoroughly. At age one this means cleaning usually the eight front teeth that exist in the mouth at this age. By age two, usually all twenty baby teeth have grown into the mouth. Waiting until your child can brush his or her own teeth is too late… by the time the 20 baby teeth have arrived in the mouth over 1/2 of all American Children already have decay. Please observe the second illustration showing the use of Satin Tape to cleanse spaces not reached by the toothbrush. These so called 'interproximal spaces' collect food and bacteria and must be cleaned along with the tooth brushing. While cleaning your child's teeth keep a constant lookout for anything that looks like decay (brown areas or defects in the enamel). If you detect anything that looks like early decay, consider having the area checked for the presence of the decay-causing bacteria, strep mutans. It is claimed that 30% of all American children already have these pathogens present in the mouth and they have been found in children as young as three years old. Getting an early start in controlling these critters will do a world of good for your child now and in later years. If you do identify visible decay on the tooth enamel, you could make a wise assumption that strep mutans is already present and in levels high enough to start doing obvious damage. Continue at least daily cleaning of your child's teeth until the child can begin to partly take over. Some children are able to assume this responsibility earlier than others. Those who have been exposed to this method from birth will be better able to begin taking care of them­selves at an earlier age. When the child begins to use the brush and tape for himself he will need careful supervision for quite some time. It is IMPOR­TANT to establish a basis of good oral ecology - the child's future depends upon keeping his or her mouth free from the germs that cause decay. Now, if you are ahead of the game, this new approach heads off the problem before it ever starts. This is the essence of Oramedics, stopping the disease and therefore eliminating fear and needless expense.